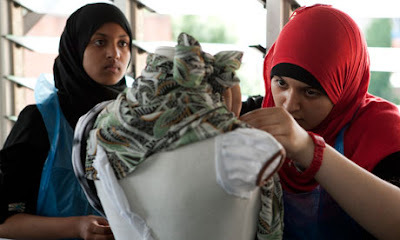 The Guardian's interest in Muslim fashion continues in an article published yesterday. I was recently contacted by a girl who was preparing a portfolio about British Muslim fashion. This was part of a project whereby girls from different Islamic schools in London took part in fashion workshops, and then had to create a portfolio in order to enter a competition and win a place at a 3-day course at the London School of Fashion! You can read more about it below. If you were one of the girls on the course, tell us more about it! In a first floor classroom in the Hackney campus of the London School of Fashion a small group of young schoolgirls are wrapping clothes on to tailor's dummies. They are using conventional clothes in unconventional ways – turning ties into belts and baggy T-shirts into neckwear. The idea is to challenge traditional notions of normality in fashion. The approach is a common one for aspiring designers but it feels especially appropriate for the 20 assembled schoolgirls, all of whom are British and Muslim and all of whom are in traditional Islamic dress. It's so refreshing to see The Guardian have an open mind to hijab. Only today I was reading horrible articles on the Daily Mail website about Hijab and Muslim women; so stereotypical and the comments people were posting angered me so much. wow, i want to hear more about this! Salam guys - I actually worked with the company who ran this whole scheme, it's such an amazing oppourtunity seriously!! P.S. I'm so glad Jana is posting this stuff!